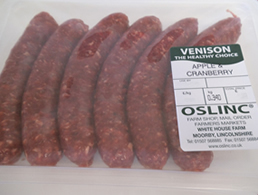 6 Venison Apple and Cranberry Sausages, packed in a tray and sealed for freshness. Gourmet Sausages at their best! Our Venison Apple and Cranberry Sausages are low in fat and full of fruity flavour, made fresh and suitable for home freezing.